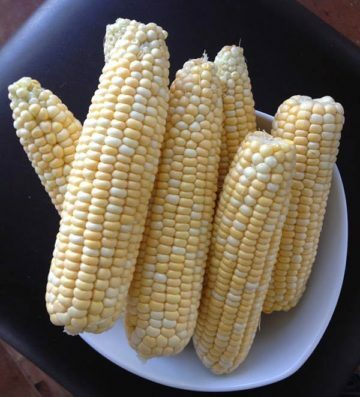 Corn is native to the New World. Pueblan Indians speak of corn as the fifth element; there was earth, air, fire, water—and corn. That last sentence should be read slowly. We are keenly appreciative of how central rice is to the Asian diet. Perhaps we take more for granted that the European diet from which most of our ancestors migrated to American soil was heavily reliant on wheat. But when Columbus got here it was a world of corn. It was only through the pilgrim’s acceptance of and adaptation to corn that allowed for their very survival. Betty Fussell wrote the definitive book on corn, “Crazy for Corn”. She states, “We don’t just eat and drink corn as a vegetable and a grain. We eat it converted through fodder into pork chops and beef steaks, chickens and eggs, milk and cheese. We drink it as beer and whisky and soda pop. Corn is the base not just of our good chain but of our industrial chain. Industry eats corn chemically as an oil, a starch, and a sugar. Anything petroleum can do, corn can do better. We use this industrially converted corn in thousands of different products from cradle to grave, from talcum powder to embalming fluid. Every one of our lives is touched every day by an invisible network of corn”. While working in our kitchen last year I got a phone call from a friend who is also an aspiring poet/writer specializing in food and shall I say “sensual writing”. As I was listening to her latest passages, one of my chefs set a hot pan of freshly roasted corn down on the counter to cool right by me. He had cooked it in the husks and I tore off a little of the ridged, warm, pliant wrapper and pressed it to my lips. “Oh, Man”, I helplessly let out. My friend on the phone intoned, “Norman likes that part, eh?” But it was the corn. I didn’t explain. I didn’t wish to diminish her happiness. But now I was hopelessly distracted into a glowing memory connection and while limbs were writhing on the other end of the phone, the only ears I wanted to nibble were coming into view through memory-land. It was an early dusky evening in the late summer of my rural Illinois childhood. Our windows were always rolled down in the summer then-and as we pulled into the church parking lot it was as if an airshaft to sweet heaven was pouring directly down and engulfing us all. It was the one night of the year our church held its “Corn Roast”. I couldn’t get out of the car fast enough. The men and women working there had bushels upon bushels of corn that grew in the fields all around us and were working feverishly over the huge glowing charcoal braziers to meet the crowd’s demands. Whatever else was served escapes me.